I listened to the audio book version first and found that there is so much good advice in this book that I had to get a physical copy for reference. "Lawyers. Accountants. Radiologists. Software engineers. That's what our parents encouraged us to become when we grew up. But Mom and Dad were wrong. The future belongs to a very different kind of person with a very different kind of mind. The era of "left brain" dominance, and the Information Age that it engendered, are giving way to a new world in which "right brain" qualities-inventiveness, empathy, meaning-predominate. That's the argument at the center of this provocative and original book, which uses the two sides of our brains as a metaphor for understanding the contours of our times. In the tradition of Emotional Intelligence and Now, Discover Your Strengths, Daniel H. Pink offers a fresh look at what it takes to excel. A Whole New Mind reveals the six essential aptitudes on which professional success and personal fulfillment now depend, and includes a series of hands-on exercises culled from experts around the world to help readers sharpen the necessary abilities. This book will change not only how we see the world but how we experience it as well." What I really liked about this book is that it was a mixture of a physiology book and a self help book. It had very interesting facts and information and also great links and reference material to check out on your own. Great quotes too! "Good design is a renaissance attitude that combines technology, cognitive science, human need, and beauty to produce something that the world didn't know it was missing." - Paola Antonelli, curator of architecture and design, Museum of Modern Art. I have always been very passionate about the support to nurture the right side of the brain as much as the left side in school, business, etc. 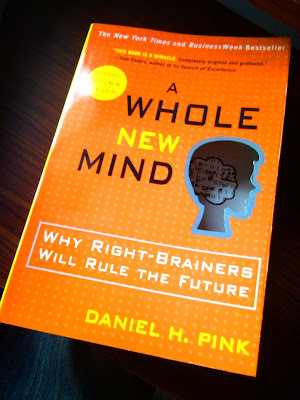 and I am very pleased to see that Daniel Pink did his research and composed such a great book that accurately describes the state of the information age we are in now and how the current push in schools and business to favor the left side will eventually hurt our economy and well being and create a greater need for creators (right-brainers) in the future. His personal tips to help sharpen the right side of your brain are not only fun but self rewarding and will give great benefits beyond just a good career. Painting of a palm tree in tree.